Welcome to the first News and Flues of 2016! Thank you for your continued support last year, we hope it was a successful year for you. We wish you all the best for a healthy and prosperous 2016. We have a busy year ahead of us and with several product developments, and Enterprise Resource Planning (ERP) software implementation, which will incorporate for you the option to order online. When Ray started the business in 1968, he could not have imagined the extent to which Midtherm and associated companies would grow. He has now decided to step down as Managing Director but will continue as Company Chairman. Ray would like to thank all customers for their continued business over the years. Ray’s son Richard Andrews, who has been with the business for over 25 years has taken over as Managing Director. Kevin Woodbine, who joined Midtherm 6 years ago as the senior accountant, has stepped into the role of Operations Director. 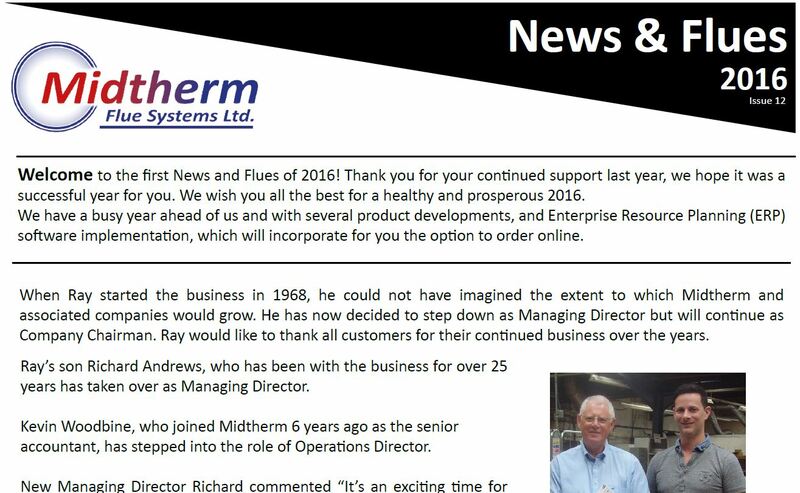 New Managing Director Richard commented “It’s an exciting time for Midtherm with several developments in the pipeline, the business will continue to operate using the same company ethos it started with. I share the same values as my dad with regards to integrity and quality. I am confident that if we put in the same hard work and determination that my dad instilled over the years Midtherm will continue to be a great success!”. Introducing our Twist Fit Clay Pot Adaptor, designed and tested in our factory in Netherton; it eases and speeds up the installation process. These are available from stock in 125mm and 150mm diameters, you can choose from stainless or terracotta finish. Powdercoated finishes are also available to order upon request. The Stainless Steel Birdguard with base is designed to prevent bird, leaf or vermin entry whilst also helping to prevent rain entry. It is made from 1mm thick stainless steel with 25mm square mesh. The Birdguard fits onto chimney pots up to 250mm diameter and terracotta powdercoated finish is available.